"It's pre-K for all unless you live on the Upper East Side," Kallos said. UPPER EAST SIDE — Parents are ticked off that their students have been assigned to pre-Kindergarten centers far from home — some as far as 45 minutes away — and are planning a rally next week to demand more seats in the neighborhood. More than 900 4-year-olds and their families applied for pre-K this year, but there were only 596 seats available on the Upper East Side, meaning that 300 students and their parents must travel outside the neighborhood to get to school, according to City Councilman Ben Kallos. Some students were assigned to seats as far away as the Financial District and near the Brooklyn Bridge. "I don’t think a 4-year-old should have to ride a busy, over-crowded subway every morning to get to school, and I don’t think parents are equipped to wake up in morning, travel 45 minutes to school in the Financial District and 45 minutes back to wherever they're going, and do it again after work," Kallos told DNAinfo New York on Friday. "It would add an hour-and-a-half of commuting every day for parents … and would be tough on a 4-year-old." Shira Aluf Castro, a mother of a 4-year-old on the Upper East Side, said they didn't get a single spot in any of their top choices. Instead the city placed her daughter 49 blocks away from their apartment. "No way will I send my kid there," she said. Marisa Shem was expecting her 4-year-old to get sibling priority at P.S. 267 this year, but the school canceled its pre-K program. Instead, her student got a seat at the Pre-K center on 35th Street. "This means that even though we are already a public school family, my second child doesn't stand a chance in obtaining a UPK spot in the neighborhood," she told DNAinfo New York in an email Friday. "Although I was told I am 'lucky' to have gotten a spot within the district, a center that is several miles away is not a viable option." That's why Kallos is spearheading the rally with Upper East Side parents on Sunday, April 30, at 1 p.m. at St. Catherine's Park, at First Avenue and 67th Street, to demand the Department of Education add 300 more seats immediately for the East Side, he said. "Every single child in my district should have a guaranteed public school seat in the neighborhood," he added. "I am disappointed in the city and their failure to keep their promise of pre-K for all. It is pre-K for all unless you live on the Upper East Side." Kallos wrote a letter to Mayor Bill de Blasio and DOE Chancellor Carmen Fariña on April 17 demanding more seats. Other local elected officials signed the letter including Congresswoman Carolyn Maloney, Borough President Gale Brewer, State Senator Liz Krueger, Assemblymembers Rebecca Seawright and Dan Quart, and Councilman Dan Garodnick. "I find it hard to believe that in the name of equality, the city is willing to spend half-a-billion dollars on a garbage dump rather than providing equal pre-K for all on the east side," Kallos said, referring to the controversial East 91st Street Marine Transfer Station. "I felt that the city was working in earnest partnership with the DOE, our office and parents to get more pre-K seats, but that is no longer the case." A representative for the DOE said during a 2018 preliminary budget hearing on March 21 that the agency is in "a crunch" this upcoming school year but that it is "working diligently" to find seats in the district, including four additional classrooms in 2018. During round one of admissions this year there were 698 students living in the Upper East Side that applied for seats and 461 seats available, according to the DOE. But not every application was for a seat in the area and not every application materializes into a student enrolling or pre-registering for a seat, the agency says. According to the city's numbers, there are currently 529 seats in the area, including seats at five new sections added this year at P.S. 6, the Yorkville Community School, P.S. 290, P.S. 59, and Vanderbilt YMCA. The agency's School Construction Authority is in "active negotiations" to find more pre-K sites in the coming school years and will put out an additional Request For Proposals (RFP) for seats this summer and in the fall of 2018, DOE officials said. 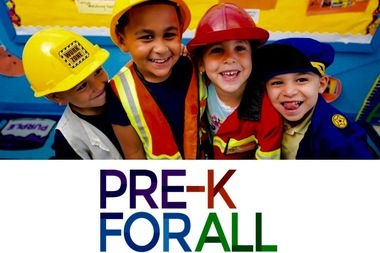 "Through Pre-K for All, we’ve quadrupled the number of free, full-day, high-quality pre-K seats in this area since 2013-14, and we continue to take steps add more seats and meet local demand," said Will Mantell, a DOE spokesman. "There is a free, full-day, high-quality pre-K seat for every 4 year old in New York City, and our pre-K enrollment specialists will work with families — across the Upper East Side and all five boroughs — to find the best pre-K seat for their child." Despite complaints over a lack of seating on the Upper East Side, the city says that 70 percent of Manhattan families received their top choice, up from 69 percent in 2016. Across the city, a record 69,510 students enrolled this year, which is more than a three-fold increase from 19,287 during the 2013-14 school year, according to DOE officials.